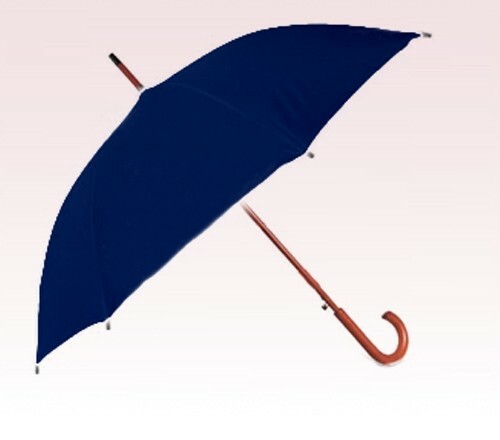 Personalized navy blue 48” arc auto opening fashion umbrellas are worth investing and they can bring high business benefits to the investors with high expectations from their campaign. This umbrella easily shows up above heads due to its larger canopy, and a brilliant structured canopy. People love carrying it because it offers them complete protection from harsh elements of nature and also pumps up their fashion quotient. Features – 48” arc deluxe navy blue canopy, pushbutton automatic opening, wood shaft with matching ferrule and tips, deluxe carved maple handle and is offered with a navy blue fabric case with shoulder strap. Imprint area - 7”H x 7”W.